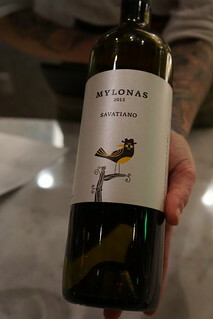 The next pairing was Mylonas Savatiano from the Attica region of Greece. 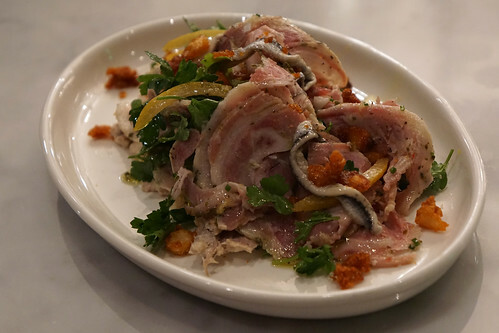 A unique take on veal tonnato - the sliced veal was very tender. Instead of the usual tuna-flavored creamy sauce there are bits of fish meats and anchovy aioli. 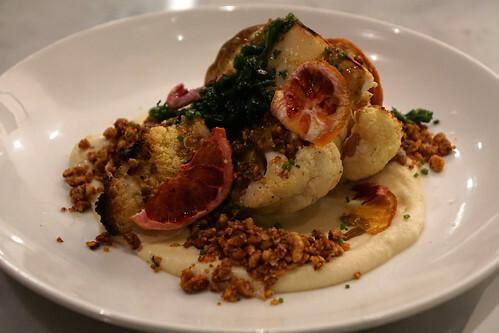 Roasts are an important part of Waypoint's menu, both the large format meat or fish dishes and small vegetable plates like this. 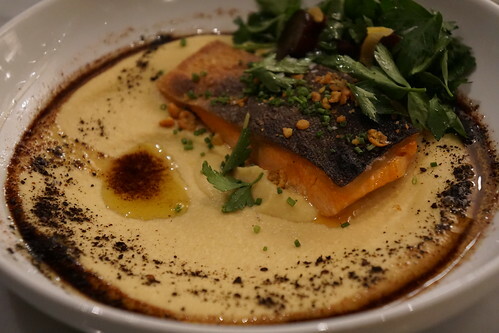 The acidity from the orange ties the creamy miso and cauliflower together well. I could never turn down uni pasta! 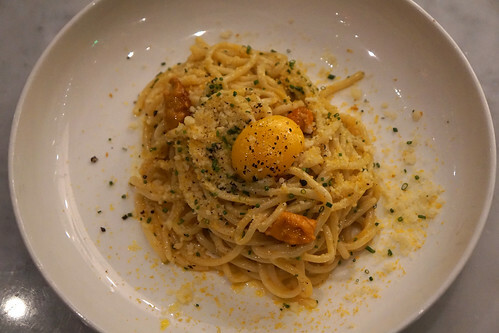 The pastas at Waypoint are made in house and you can tell from this bucatini. While I still miss my plump, creamy Santa Barbara uni, I loved the combination of uni with the smoked egg yolk. Nicely roasted belly - the best part of the fish. 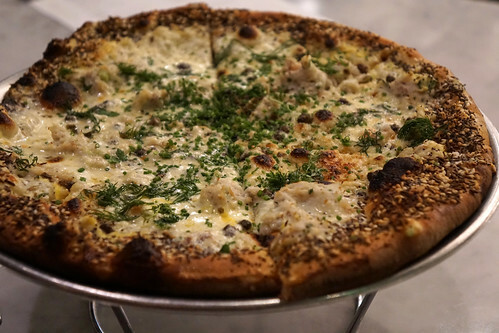 Smoked whitefish pizza with mascarpone, dill and capers - think sesame bagel for the pizza crust! This was a fun pizza that reminded me of eating bagels with fish - I may actually like it better than bagels. 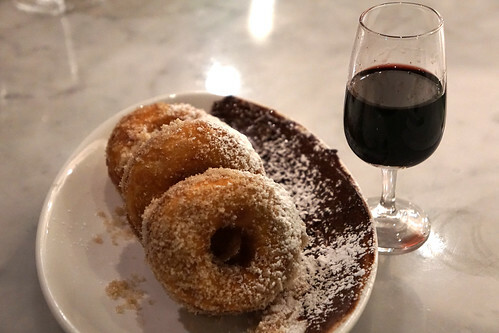 For dessert, we had donuts with cinnamon sugar and paired with port. After this tasting menu, I loved Waypoint so much I took my high school friend there when she visited. 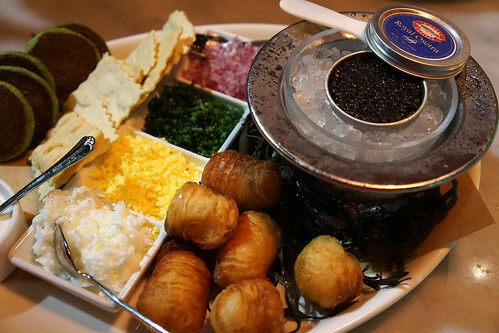 She splurged and got the caviar service with Royal Osetra caviar. The caviar is served with corn blinis infused with phytoplankton, savory croissant donut hotels, finely chopped eggs, scallions, and onions. And of course, saltine crackers. Those savory croissant donut holes were so good. Even without the caviar I'd want more of them. The cocktails at Waypoint can be really good, but it can also be too weird. Granted, I'm guilty of ordering the strangest-sounding drink on the menu. Waypoint touts its absinthe cocktails, of which they normally have four on the menu. Most of the drinks on the menu rotate regularly. In general, I've enjoyed their absinthe cocktails and their spirit-forward drinks. They tend to have some nice tiki-style drinks, as well, but on my last visit I tried some cocktails that were too strange and vegetal for my taste, such as one with tomato water and herbs and salt. 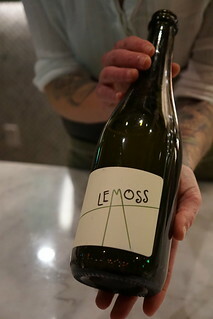 The wine list, though, has always been strong. 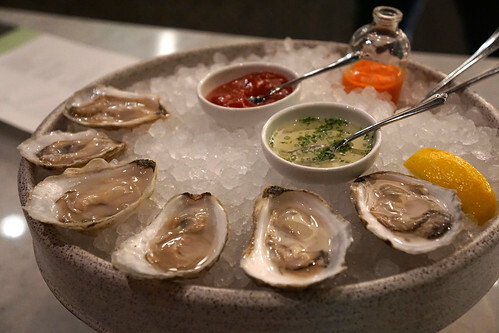 For seafood dishes that go beyond the typical lobster roll and clam chowder, Waypoint is one of my go-to in Boston. 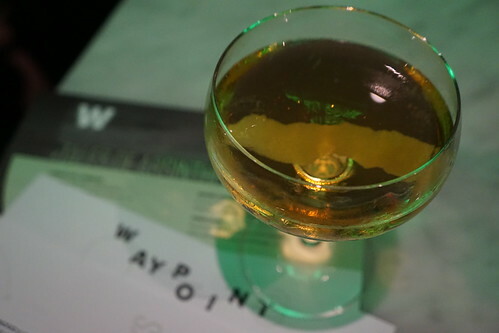 Besides the fresh seafood, homemade pastas, and other well-prepared dishes, Waypoint is also a good place for cocktails in this area of Cambridge, although you might want to tread the menu carefully.